Designed to stand up to the roughest treatment while remaining attractive, our heavy duty metal beds and heavy duty metal bunk beds combine sturdy construction with comfort and support. Available in a range of intensive use furniture collections, we have the heavy duty metal beds to meet your demanding space requirements. Browse our commercial grade beds and accessories, and contact us with any questions you may have. We’ll be happy to assist you in finding the right heavy duty, intensive use metals beds for your situation. Commercial Supply Distributors heavy duty metal beds and heavy duty metal bunk beds are built for durability and continuous use and are excellent for your corrections, institutional, residential housing, homeless shelters, firehouse, and more. For more information on our long-lasting, heavy duty metal beds, view our Commercial Grade, Heavy Duty Metal Bed Brochure or simply browse below. Description: The MT5000 is a heavy duty, institutional grade metal bed that is bunkable/stackable. The high quality construction of the metal stackable bunk beds includes 1-1/4″ square Posts and Cross tubes, all 16 gauge. They are rust-resistant, with an epoxy powder coated finish and sinuous wire construction and button hook in style. 1-1/4” square Posts and Cross tubes, all 16 Ga. Description: The MT6000 is a commercial grade metal bed that is bunkable/stackable. It is great for all types of living environments for including the military, universities, residential treatment facilities, and bunkhouses. 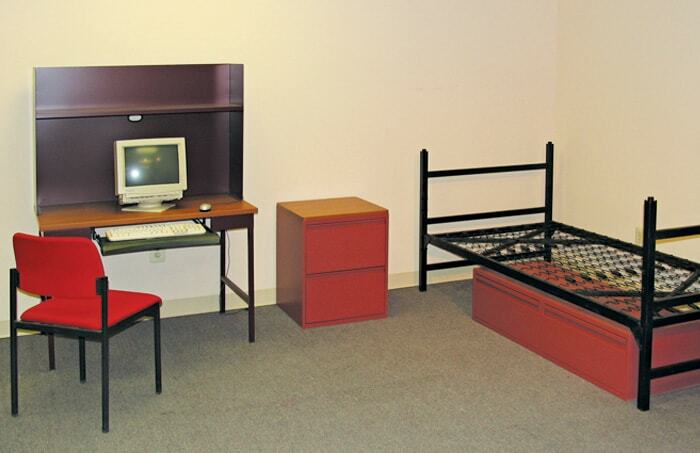 The high quality construction of the metal bunk beds includes 2″ square Posts and 1″ square and ½” round Cross tubes. They are rust-resistant, with an epoxy powder coated finish, with a tubular deck and button hook in style connector. Rust-resistant, Epoxy powder coated finish. Description: The MT8000 military bunkable metal beds are built with 1-1/2″ round 16 gauge heavy duty steel posts, ⅞” cross bars and ½” upright. Total Height 68″ to top of headboard (As a bunk) with 13.1″ clearance under deck. Clearance between decks on bunk is 37″ without mattresses. Description: This heavy duty metal bunk bed is ideal for camps and is made up of two portable steel 30″ x 75″ beds with two cross bars. It also comes with two fire retardant foam mattresses each 4″ x 30″ x 75″. The mattresses meet 16 CFR Part 1633 compliance standards. The metal is rust-resistant, epoxy powder coated finish. 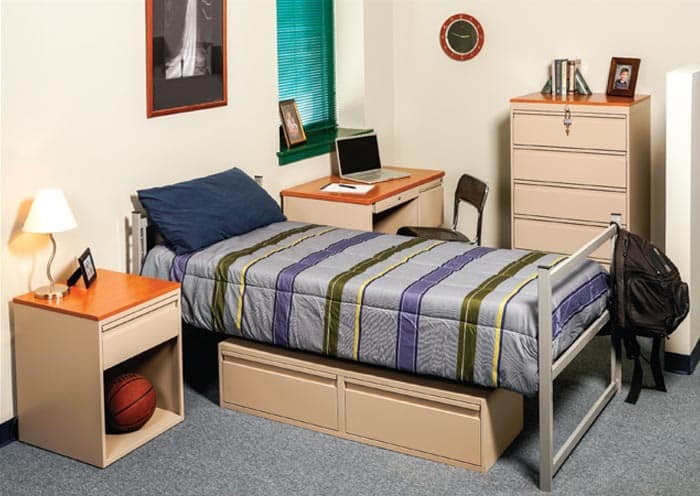 Description: CSD’s adjustable, stackable institutional beds have 7 height adjustments making these heavy duty metal bunk beds ideal for demanding space requirements. Each single metal bed weighs approximately 72 lbs. as weight will vary by size. (The GSA version is 83 lbs.) Each heavy duty metal bunk bed weighs approximately 150 lbs. as weight will vary by size. The beds are constructed of rust-resistant heavy duty metal with an epoxy powder coated finish with a sinuous wire deck with button hook in style. Bunk adapters are available for this model and these metal beds are also available to pass GSA standards. 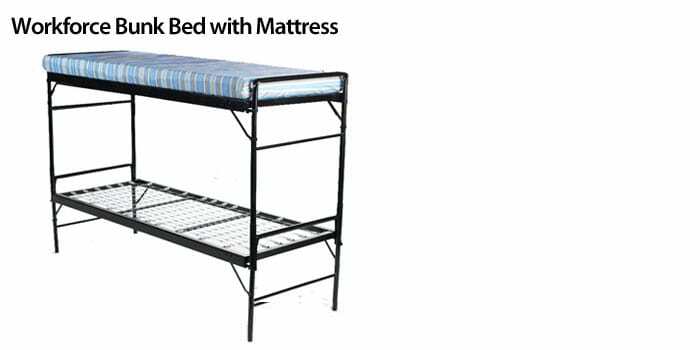 Description: CSD’s heavy duty, durable university style bed bases are constructed with 1-1/2″ angle iron frame and tubular slats. Complete with rust-resistant, epoxy powder coated finish, and 3″ Heavy Duty Tubular legs for extra strength and support. Innerspring commercial grade mattresses (mattress meets 16 CFR Part 1633) are sold separately. Our heavy duty metal bunks beds, single metal beds, metal chests, nightstands, and wardrobes offer durability combined with an attractive modern design. Built with both functionality and style in mind, the metal chests, night stands, and wardrobes have reinforced side panels and textured Sherwin Williams water-based paint with more than 30 colors options available.